The Tropical Islands Resort in Krausnick, Germany, is the world’s largest indoor beach with 400 sunloungers – and not a cloud in sight. Yet with up to 6,000 visitors allowed in at a time, there are bound to be towel-fights over them – especially as this “indoors paradise” is in Germany. 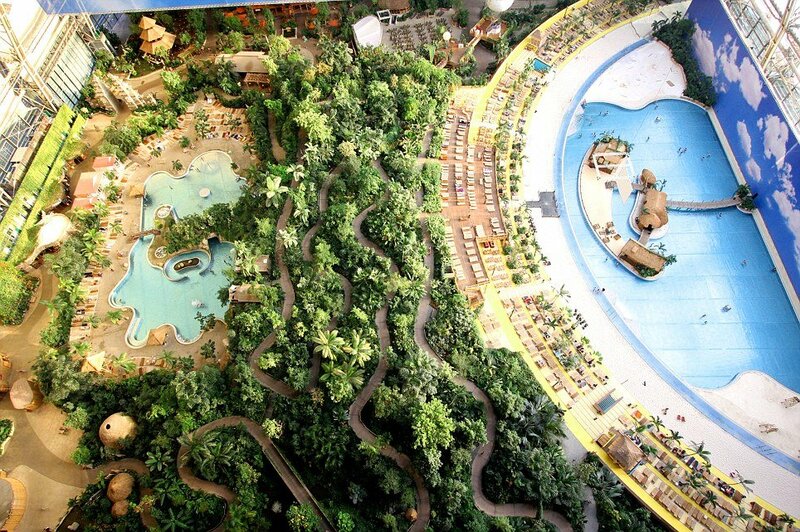 The Tropical Islands Resort in Krausnick, south of Berlin, also boasts the largest indoor pool, 50,000-plant forest – and enough space to fly a hot air balloon inside. The former aircraft hangar has been transformed into a paradise offering tourists a tropical escape, if you can ignore the fact that you are miles from any ocean – or the tropics, for that matter. The gigantic hangar was built to produce transport zeppelins but after the company went bankrupt in 1992 the hangar fell into disuse. A Malaysian company saw the potential in the hangar, which is the world’s largest freestanding building, and Tropical Islands Resort opened in 2004. Despite the impressive interior of the hot hangar, visitors reviewing the indoor tropical resort on Reddit complained about high prices on everything from beverages to accommodation and additional fees to use the popular water slides. Some users went as far as to vent their disappointment in the type of crowd attracted by the tropical escape. “It’s nice for families with small kids, but we weren’t overwhelmed (3 people in our late 20s)” another Reddit user said. The Tropical Islands Resort, located on an old World War II runway, keeps a pleasant temperature of 26C, thanks to the modified 70,000 square metre dome allowing sunlight to shine through massive windows. And naturally, if it rains or pours, a quick common can be sent to close the roof – and everyone can remain dry and happy in their tropical paradise.